This "Historically Speaking" column appeared in the Exeter News-Letter on Friday, March 31, 2017. “We’re gonna wind up in the poorhouse!” shouts every Dad ever while he turns down the thermostat. Images of the poorhouse haunted generations of people, but what exactly was it? How did communities take care of indigent members in previous centuries? Early in Exeter’s history, the population was controlled by law. People had to be approved at town meeting to become residents. A 1671 law read, “It is ordered that no man shall receive any person or persons into towne without the consent of the select men, or security for to free the towne from any charge that may ensue thereby.” An earlier law passed in 1664 made citizens financially responsible for their servants. “It was ordered and agreed at the same towne meeting that when a person so ever shall hire any servant for more or less tyme & if it happen that he that is hired shall be lamed or any ways unserviceable made, in works during that tyme he shall be kept by the charge of him that hires him, if he be not able to keep himself that sees the town may be free from such charges.” This type of tight control worked as long as the community remained small. Exeter, however, began to grow when the lumber industry took hold and it became impossible to control the population. A system developed that provided funds for those willing to take in the poor. It was an imperfect system, rife with abuse, but it did provide a minimum of care. 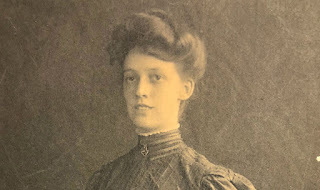 Strangers were still driven from town through a system called ‘warning out.’ In 1779, the county authorized Joseph Swasey, the constable of Exeter, to warn out Robert Peters, Scippio Dole and his wife and Hanna Florence. All were ordered to return to their previous residences. The Doles and Florence had been in town illegally for only three or four months, but Peters argued that he had resided in Exeter for nearly a year. Nevertheless, he was ordered out. In 1784, the Exeter Chronicle reminded citizens that pauperism and indolence would not be tolerated. The Overseers of the Poor, positions that were only occasionally filled at town meeting, published a notice that “sundry poor people, inhabitants of said town, spend their time idly, and neglect to provide for themselves and families, by any lawful means and neglect the care and education of their children, etc. whereby the charge and expence of supporting the poor with poor in this town, will be greatly increased, desiring that the law made to invest the overseers of the poor with power to bind out, and set them to work may be put into execution.” In short, if you are able and not working, the Overseers of the Poor could make you an indentured servant and apprentice out your children. New Hampshire state law, as passed by the General Court in February, 1781, authorized towns, at county expense, to build houses of correction or workhouses for the poor. It read, in part, that these were “accommodations for the correction of rogues, vagabonds, common beggers, lewd, idle and disorderly persons.” Aged, disabled or ill people were still cared for in the old way of boarding out. 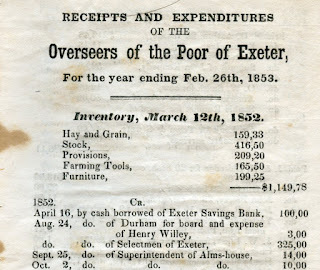 Charles Bell, in his History of Exeter, New Hampshire, tells us that, “In 1817 the town passed a vote that the selectmen and overseers be authorized to purchase a farm or house for the use of the town where they might place the poor, and that they hire for that purpose a sum not exceeding four thousand dollars. 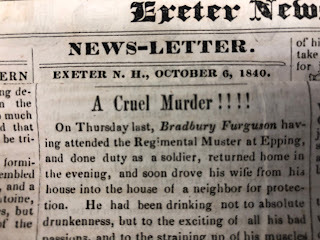 A purchase was accordingly made of a house and land near Beech Hill.” The poorhouse in Exeter existed from 1817 to 1869, although it was never called the ‘poorhouse.’ On the 1845 Merrill map of town, it’s called the “Almshouse” and on the map of 1857 it was described as the “Town Farm.” People were housed there if they were in need of direct aid or if they were in need of social correction in the form of discipline. Inmates were expected to work on the farm. People suffering from overt mental illness were sent to the state asylum in Concord. In 1869, Exeter no longer needed its poorhouse when Rockingham County opened the County Farm in Brentwood. Its goal, like the town poorhouse, was to be as self-sufficient as possible. Annual reports provide glowing examples of thrifty poor people working hard to get back on their feet. The reality was less optimistic. Inmates of the County Farm were a mix of impoverished, disabled, elderly and many were there long-term. An influx of people would arrive every winter and then leave again when the weather turned warm. Town overseers of the poor often had difficulty committing their charges to the poorhouse –as many families simply refused to go. Moving to the County Farm would break up families and interrupt children’s education. Moreover, there were moral judgements made about people that were distasteful. When the Great Depression hit in the 1930s, Exeter hired a relief agent in the hopes of offering assistance to needy families locally. It might be that a family simply needed heat assistance – a far cheaper alternative to housing at the County Farm. Gradually, the reality of a physical poorhouse became nothing more than a lingering and old saying. “Winding up in the poorhouse” is just something your Dad says. 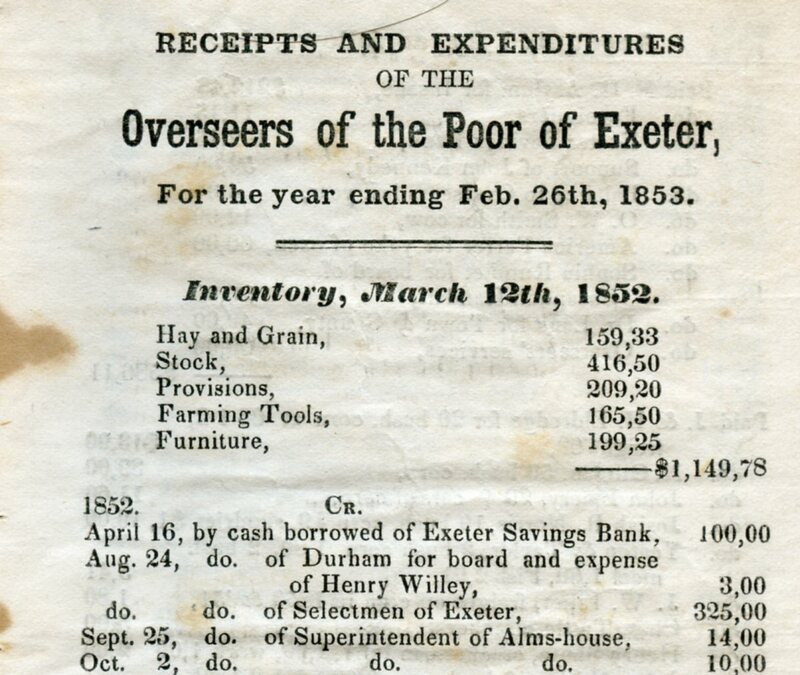 Image: In 1853, the report of the Overseers of the Poor in Exeter indicated an average of 24 paupers housed at the town poorhouse.